One of the greatest ways to see all the spectacular and hidden gems in Lake Tahoe is to discover them via bicycle. Tahoe Beach Cruiser Bicycle Rental Delivery makes it simple to do just that. 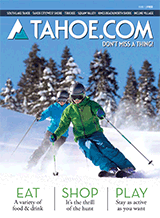 Offering free drop-off and pick-up anywhere in South Lake Tahoe as well as full 24-hour bike rental (with no hidden fees), Tahoe Beach Cruiser creates an easy way for the entire family to discover Lake Tahoe in a more intimate way. Helping to make this an even better adventure, the topography of South Lake Tahoe is, for the most part, flat or slightly rolling, making beach cruiser bikes excellent for accessing the more than 30 miles of paved bike paths. Tahoe Beach Cruiser Bicycle Rental Delivery also offers free roadside assistance and flat repair, keeping things safe no matter where you are.